Multi-talented Egyptian: Ayat Elgezery- La Mode Magazine Feature! What made us so curious about interviewing her was a picture she uploaded on her instagram account @elgezeryphotography that involves two pictures behind each other for the same celebrity, written beneath the picture “On the right side, a picture I took 8 years ago with my mobile to the first celebrity I met, without even knowing a thing about photography or even deciding anything about my career, just a little girl who loves taking pictures with her mobile phone! On the left side, I met @daliaelbeheri again after 8 years after being a photographer, took this picture of her at the grand finale of Miss Egypt 2016. You’ll never know what you’re capable of until you take that first step & go for it!” So we just wanted to know how did it all started. Elgezery is a mass communication graduate who’s passionate about her job. She started with photography at first then got involved in the media career to end up as a multi-talented person, who works as a photographer, writer and assistant director at the same time. She worked as a freelance writer and photographer with many international magazines including magazines in USA, Italy, Jordan, Egypt and worked with our magazine in Nigeria as well. She won the best photographer over Egypt’s universities in 2015. Currently she’s working with Miss Egypt/Miss world Amina Shelbaya at her TV program. She’s specialized in Fashion photography, write down about inspiring stories, loves interviewing others and cinema has been her greatest passion. 1)	When did you think of becoming a photographer? It all started at high school, I loved taking pictures by my mobile and I didn’t know I love photography or even decided anything about my future career. A year later, I chose mass communication as I love the great director Youssef Chahine and wanted to be like him, he’s such an idol! My passion for directing made me wants to know more about anything that can help me in the directing process. My father got me my first digital camera and I started taking pictures of my friends who loved my photography, I was amazed when someone asked me for paid photography business for the first time! Then I took my first photography course at collage and brought my first professional camera. Since then I can’t imagine myself doing anything but that! 2)	What about your passion for directing? Directing has been my first passion since I love the great director Youssef Chahine, I kept learning from books, videos and took directing courses as well. After graduating I joined a movie as an assistant director that taught me a lot about directing. 3)	And what about writing? Since I was young I used to have my own diary, used to write what’s going on through my day every day, and till now I still write my achievement of the day! I do love interviewing others, especially when it comes to inspiring stories. One of my biggest achievements in writing was when I got my article about an Egyptian director published in American magazine. Also I do love covering festivals, movies premiere and anything related to cinema. Cinema has always been my greatest passion. Also I love covering fashion events. 4)	How do you manage your time and priorities tasks? As I write down every day’s achievement, work is always on top of my priority list! It’s all according to the project I’m working on; I can even cancel an outing/ birthday party for work. You should always write down what your ideas to stay in focus. 5)	What is your favorite project you’ve worked on? I’ve always been asked about my favorite project, and I’ve always said my next one! 6)	What advice do you have for beginners? To start! And never give up, no matter how hard things get, you always pass failure on your way to success. 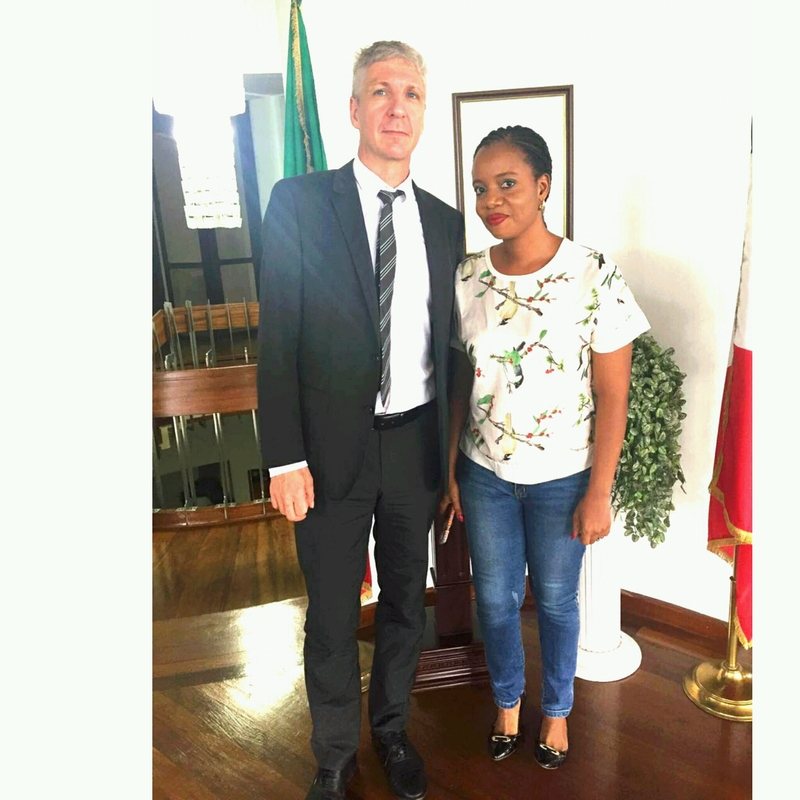 Italian Consul General Mr Andrea Pompermaie With La Mode Magazine CEO/Publisher Sandra Odige! Kancky unveils its Resort 2016 collection tagged ‘Road To Kalakuta’.